What it lacks in grain weight, it more than makes up for in penetration, speed and stopping power overall. 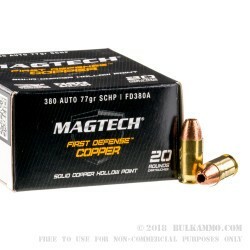 This lightweight all copper projectile seems to find a new level of performance that the .380 Auto was lacking until now. This is a potent threat stopper for the small framed .380 Autos out there. 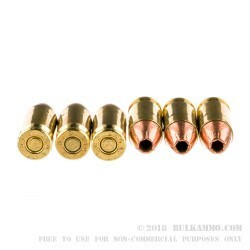 The 77 grain projectile is all copper and offers great weight retention in a jacketless design and the type of penetration a .380 hopes for, with a solid 1099 feet per second velocity and a 207 ft. lbs. of energy delivered out of the muzzle. This is a very good personal protection round for the .380 Auto, with the zippy round and the good penetration of the projectile. 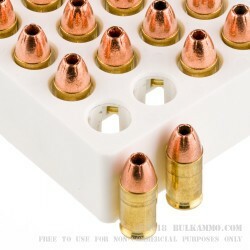 It is also effective for in car protection or other places where a copper bullet will benefit the ballistics or where there may be a barrier that might impede hitting the target initially. The brass case features a Boxer primer for sure ignition and this allows it to easily be reloaded as needed. The good powder mix is relatively clean and provides faster follow up shot in low light scenarios.